Pat the tofu dry with paper towel and cut into 2-inch cubes. In a small bowl, add all the rest of the ingredients except cooking oil to make the marinade. Mix well. Place tofu cubes into a large bowl and pour in marinade. Gently mix so that the tofu cubes are evenly covered. Let them rest for 10 mins while you prepare the breading station. Place breading ingredients in 3 separate shallow plates. In sequential order, dip each tofu cube in flour, egg and breadcrumb. Repeat until all the tofu cubes are breaded. 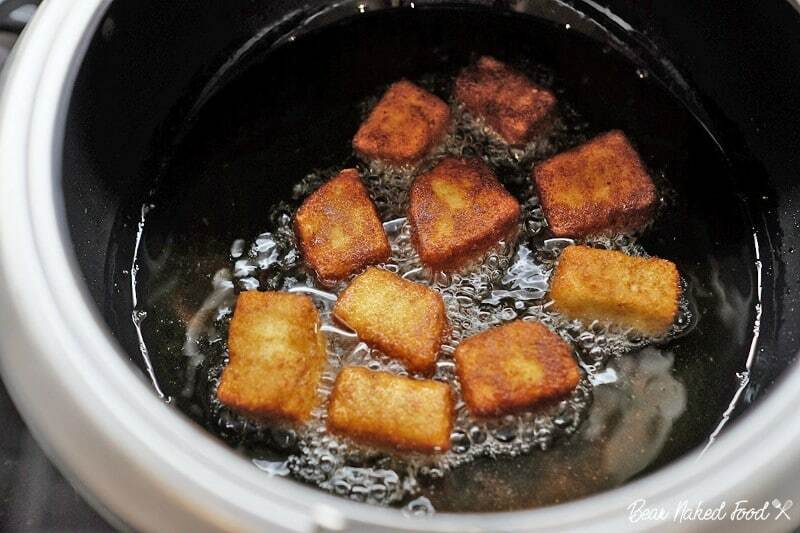 Gently place tofu cubes into hot oil and fry them over medium heat until golden brown. Drain and serve warm with your favorite ketchup or chilli dip.